There aren't many people who don’t go a little crazy over sticky drumettes. They always seem to be the first thing on the table to go. These are especially moist and tender as only a steam oven can make them. 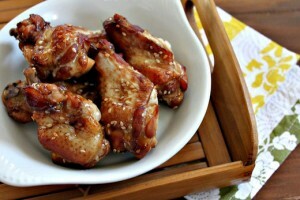 Combine Kecap Manis, oyster sauce, sesame seeds in a large bowl. Add chicken and mix well. Cover and return to the fridge for at least 1 hour or overnight if possible. . Line universal pan with Foil (for easier cleanup) and insert wire grid. Arrange drumettes on wire grid and cook on the lower shelf position on steam bake at 400° F for r 20 minutes or until the internal temp is 170°F. Let rest for 5 minutes. These will disappear so quickly that you may want to double the recipe.